[2 mins. 38 secs.] 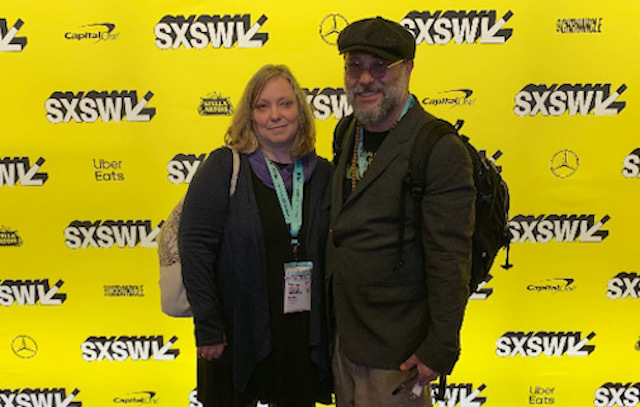 Filmwax Radio's man on the ground Ronald Wohlman is at SxSW 2019 and sending dispatches about 4 films that he caught whilst at the festival. Interviews include Erin Derham ("Buskin Blues") about her new documentary "Stuffed" which is having its festival premiere at SxSW. “Stuffed” is a documentary feature film about the surprising world of taxidermy. Told through the eyes & hands of acclaimed artists across the world, the film explores this diverse subculture where sculptors must also be scientists, seeing life where others only see death. From an all-female studio in Los Angeles to fine artists in the Netherlands, these passionate experts push creative boundaries. The film highlights a diversity of perspectives including an anatomical sculptor in South Africa & a big game taxidermist in Ohio. And, in an unexpected twist, “Stuffed” reveals the importance of preserving nature, using taxidermy as its unlikely vehicle, and the taxidermist as its wild driver. [25 mins. 56 secs.] Up next, Canadian filmmaker Ricky Tollman with his new feature "Run This Town" which had its U.S. festival premiere at SxSW. After graduation, Bram gets his dream job at a local newspaper. In his mind he’s the next Woodward (but he’s probably more of a Bernstein). A year in, he realizes that maybe the paper business is no longer what he’d seen in the movies. Instead of investigative journalism, he is writing easily consumable Top 10 Lists - Best Hot Dogs in the City! Ten Ways to Tell You Grew Up in the 90s! After the paper is hit with another round of layoffs, Bram stumbles upon a potentially explosive story involving the city’s controversial mayor. But he needs to beat the mayor’s smooth talking aide, Kamal, to the punch. This could be Bram’s big break — if he had any idea how to be a real journalist. [46 mins. 4 secs.] Then filmmaker (and Columbia University MFA Film Department chair) Hilary Brougher about her new feature "South Mountain" which is also having its festival premiere at SxSW. Lila (Talia Balsam), is an artist who teaches at a community college and has built a modest rural paradise in New York's Catskill Mountains with her husband, Edgar (Scott Cohen). Soon after their teen daughters head off on Summer adventures, and her best friend Gigi (Andrus Nichols) begins Chemotherapy, Edgar reveals he's begun a new family with another woman, leaving Lila alone for a season of explosive grief and self re-discovery that focuses on an unconventional friendship with a younger man. [1 hr. 11 mins. 42 secs.] Last up is Rodney Evans with a new documentary called "Vision Portraits" which had its U.S. festival premiere at SxSW. "Vision Portraits" is the personal story of filmmaker Rodney Evans ("Brother To Brother") as he embarks on a scientific and artistic journey, questioning how his loss of vision might impact his creative future. Through illuminating portraits of three artists: a photographer, a dancer and a writer, the film looks at the ways each artist was affected by the loss of their vision and the ways in which their creative process has changed or adapted. Follow us on Facebook, Twitter & Instagram. The podcast is also available on iTunes, Stitcher, Spotify, Google Play & Youtube.